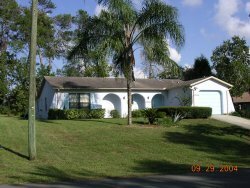 The villa is located in Spring Hill, Hernando County which is situated in the middle of the Gulf Coast. The temperature averages in the 60's in January and 80's in July. The property is fully air-conditioned and comprises three bedrooms, two bathrooms, a large open plan lounge and kitchen with an adjacent dining room. 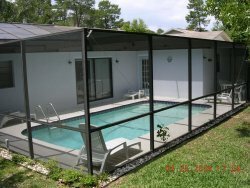 Patio doors from the lounge lead to the pool area which is within a screened enclosure. There are two bird feeders in the garden and if you keep them filled with wild birdseed you will be rewarded with visits from some of Florida's beautiful bird life. There are also a few squirrels and their antics at trying to remove the feeder lids can prove as equally entertaining. It is advisable to wear shoes when walking around the garden as the ants are inclined to bite. Telephone calls within the area are not charged. It would be helpful if you would keep a detail of any long distance calls you may make, and relevant dates, and let us have a copy of the list on your return. When we receive the bill we will adjust the amount of the deposit and return the balance accordingly. To call the UK dial 011 - 44 - drop the first zero of the area code and complete the number as usual. In the event of a problem we have local agents for the property and they can be contacted for almost any problem. They are able to contact us by telephone in the event of any emergency but we are sure that everything will go smoothly. This is our home in America and all we ask is that it is treated with consideration. Contact details will be sent to you when you have completed your booking.